In the last few years, salads have become the most popular meal among those who want to stay fit, lose weight or manage lifestyle diseases. Traditional Indian meal preparations are being put in the back-burner to make way for exotic salads. It is easier to find iceberg lettuce and cherry tomatoes than the local drumstick greens and cluster beans in supermarkets in Bangalore. Most people find it bland to have salads on a regular basis, especially those who love the myriad flavours of Indian cuisine. I’m one among them and as much as I love to make healthy food choices, I just cannot have a salad as a meal on a daily basis. Yes, there have been few times when I wanted to whip up a quick salad for lunch but such days are quite rare. I prefer to eat a proper Indian meal with a portion of raw salad as an accompaniment. When we order a plate of exotic salad in a restaurant, it tastes yummy and the main reason is the “dressing” that is added to salads. Most of these dressings are mayonnaise-based - creamy and loaded with salt and other flavour enhancers. We don’t get the same taste, while we make salads at home. Some of us tend to make the dressing at home from scratch, while others resort to quick fixes like readymade salad dressings that can be squeezed out of a bottle. 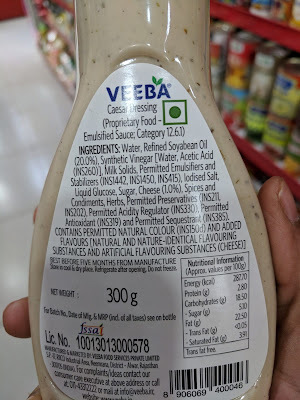 The Veeba range of salad dressings has become popular these days, especially among people who have exposure to global cuisines. The supermarket shelves are lined up with many different varieties - Caesar dressing, Thousand Island dressing, South West dressing, Honey Mustard dressing etc. But do we know the ingredients in each of them? Phew, such a long list !! 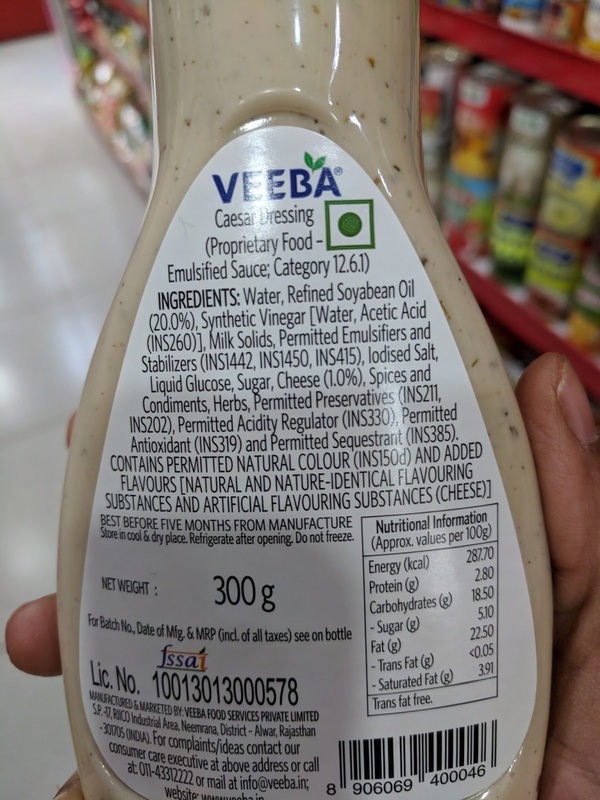 1) What’s the point of eating a salad with such chemical-filled dressing (10 ingredients that begin with INS)? 2) Typically, Caesar dressing is made with raw egg yolks. But this vegetarian version has 22.5% of unhealthy refined fats. 3) Sodium values are not specified in the nutrition table, but my guess is that it is quite high to make such dressings addictive. Similar list with so many “permitted” synthetic ingredients. Though the vinaigrette salad sauce is low in fat, the sugar levels are high. 100 gm contains 17.34g of sugar. I also checked out their “Sweet Onion sauce", where the sugar levels are extremely high. 100 gm contains 38.59g of sugar (second listed ingredient is sugar whereas the % of dehydrated onions is only 10%). They might have named it as "sugar sauce” instead. It is always healthier to make a basic salad dressing at home - whisk together lemon juice, extra virgin olive oil, salt, pepper and dried herbs. Or even a basic Indian style dressing (lemon juice, salt, pepper, roasted cumin powder, chaat masala) will make your salads tasty and healthy. Do we need such “Veeba ka khamaal” in our plates? Their ads claim that they have around 40 varieties of sauces, spreads, mayonnaise and dressings. Before you buy any of them, please do go through the ingredients and nutrition facts.